My obsession with office supplies started at a young age. I'm pretty sure Lisa Frank and Trapper Keepers are partly to blame. The style has matured (thank goodness), but the obsession remains. One item I find almost irresistible is a good Moleskine. This one keeps my life organized, but perhaps even more irresistible are these cute little pocket moleskines. They are inexpensive, the perfect size, and the cover practically begs you to get crafty. 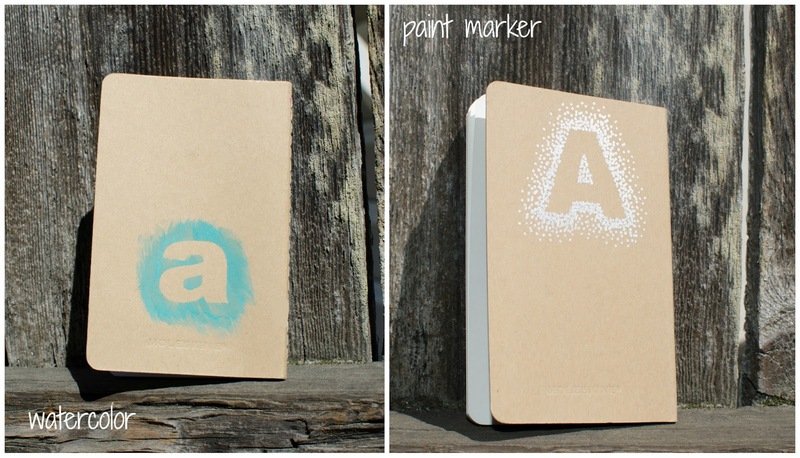 I got a personalized version of these notebooks as a wedding favor once - brilliant. A favor people would actually use. These would also be adorable stocking stuffers, party favors, or part of a wedding party gift. I got a fresh set a few weeks ago. Oh the possibilities! 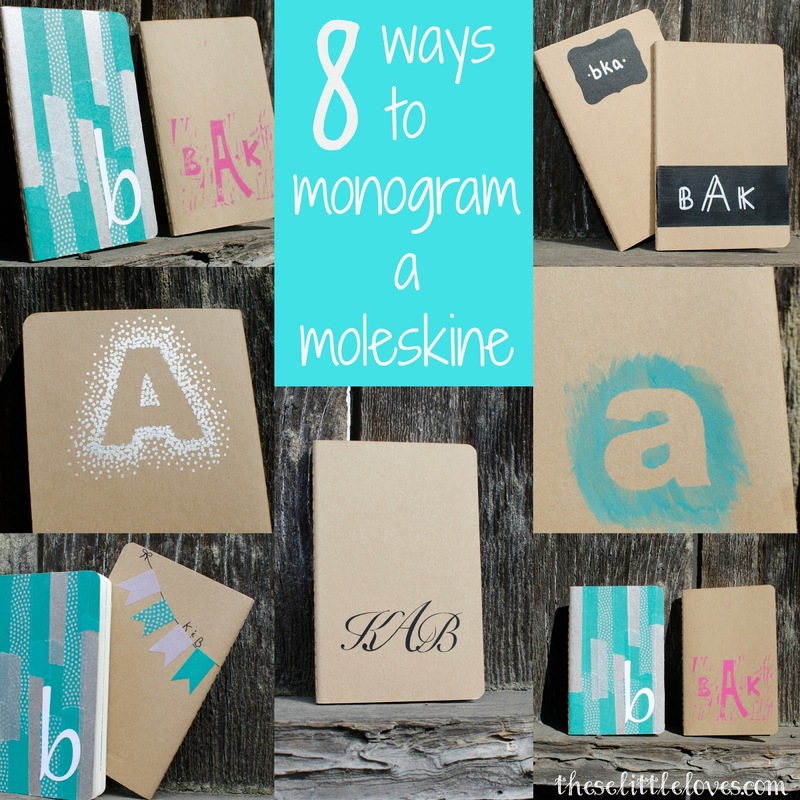 In the end the southerner in me won out and I set out to create a few fun ways to monogram a moleskine. I dug into my crafting supplies and here are the results. Washi Tape. The newest staple in my craft supplies. I did two washi tape versions. For the first, I layered washi tape on the front and trimmed the edges with an exacto knife (this looks cleaner than wrapping the tape around the back). The white 'b' was cut using Silhouette White Sticker Paper and then adhered to the washi tape cover. If you don't have a Silhouette Cameo you could use any letter sticker. For the second version, I combined washi tape and hand drawn decorations using a Sharpie Pen. I cut small bunting flag shapes from the tape and then drew the string and letters with the pen. Washi tape can be slightly see through so I think bold colors look better here. Another fun washi tape idea - you can create page markers/dividers by folding washi tape over the edge of the paper. Vinyl. For a more traditional/classy look I created a script monogram on my silhouette cameo by merging letters from a script font on my computer. You just have to be careful that the flourishes don't get too thin or you might have some trouble with getting a clean cut. Once I had the right design, I cut the vinyl and transferred it onto the notebook. Linocut. This was perhaps the most difficult in some ways, though I really like how it turned out. If you are unfamiliar, linocut is a technique where you carve a piece of linoleum with a special tool, then ink the remaining surface with a roller and then print onto the surface similar to a stamp. Chalkboard. 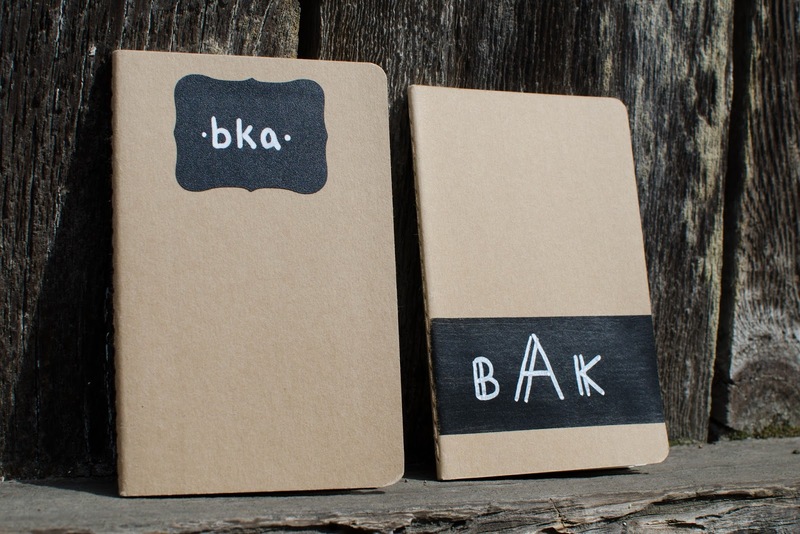 I love the idea of a chalkboard cover to these notebooks. You can be a little less afraid to try different decorations and just erase them if you hate it. You will have to use a Chalk Marker so your design doesn't erase without water. I used a white chalk marker here, but they do come in lots of colors. To get the chalkboard surface, I used two different products. The smaller scalloped chalkboard is actually a chalkboard vinyl sticker. You can purchase these pre-cut or cut them yourself using a Silhouette. The second version was created using a chalkboard paint. I taped off the boundaries of the area with washi tape (don't use anything that will pull paper off of the cover when removed) then applied a few coats of a black chalkboard paint (which also comes in various colors as well). I removed the washi tape borders and let dry overnight. Watercolor. Using a vivid watercolor and a brush that is not too wet, you can get bright colors without warping the paper cover. The brush on the dry side also helps prevent the color from seeping underneath a simple letter stencil. Paint Pen. For my final version of a moleskine monogram, I used a simple letter stencil and a metallic paint pen (though you could just as easily use a marker). I added a few pieces of rolled washi tape to the underside of the letter and carefully stuck it to the front of the notebook. While holding the letter down, I first made dots around the edges of the letter to get a clean border. Once I had the border, I removed the letter stencil. Then with decreasing density I added dots moving away from the letters until they sort of fade out. I love how it reminds me of polka dots and confetti at the same time. I only had 4 new notebooks so 8 designs maxed out my space (you'll notice I used the back side on a few of these). I can't decide which one to use first:). Have fun designing your own!